Story - 5: It occurred to me after reading this issue that despite being familiar with the character for my entire life I never really "got" General Zod. Terence Stamp did an amazing job bringing the character to life in the films but growing up during a time where Superman was the true Last Son of Krypton in the comics the good General didn't have a whole lot of screen time in the books I was reading. A version of Zod was pivotal to Superman leaving Earth for a time which led to several years of stories but other than that he just wasn't a thing and the various attempts to bring him back in the 2000s have ranged from good (the film MAN OF STEEL) to barely a villain (Geoff Johns' version) to forgettable (the version from FOR TOMORROW). None of those made me feel much about the character. Zod was my favorite part of this issue, which was surprising because the cliffhanger from the last chapter had me excited for the Superman Family duking it out with the Superman Revenge Squad. I came into this book looking forward to an epic fight and while there was fighting the most epic thing was General Zod having enough of�well, everybody and finally stepping up to be the main villain of this arc. It was an amazing twist on Jurgens' part and the best sort of bait and switch. It wasn't surprising. This is a group of villains after all who have banded together out of self-interest. Mongul, Blanque and Metallo could have made power plays at any point given their personalities but making Zod the betrayer allowed Jurgens to make this version of Zod one of the main villains in Superman's rogues gallery. It wasn't just the betrayal of the Cyborg and Eradicator that did this nor was it the beat down Zod gave Superman, though that was good from a story perspective as well. It was his personality. The disdain Zod has for the son of Jor-El has been there for a few issues but after discovering that Superman had a son, things got kicked up to eleven. The line about Superman not deserving a family was telling and gave Zod an added depth to his character. It's not that Zod hates Superman because he's the son of his jailer or won't stand with his people as they destroy Earth to recreate their home. Zod hates Superman because he has been given countless opportunities and has wasted them by being too weak to embrace the power he possesses. When Zod says Superman doesn't deserve what he has what he's really saying is that you don't deserve what you have but I do and I hate you for that. The various battles that took place over the issue were fun. It made me want to see more of this group fighting together. I liked Jon wanting to get into the fight and Lois explaining why he can't and the supposed explosion that destroyed their escape vehicle made for a dramatic moment. This chapter hit all of the right beats and gave us yet another cliffhanger that makes getting the next issue non-negotiable. Art - 4: I can't find fault with the art in this issue on a technical level. The page layouts are dramatic and the action lives up to the intensity of the story. I'm just not a fan of the style. 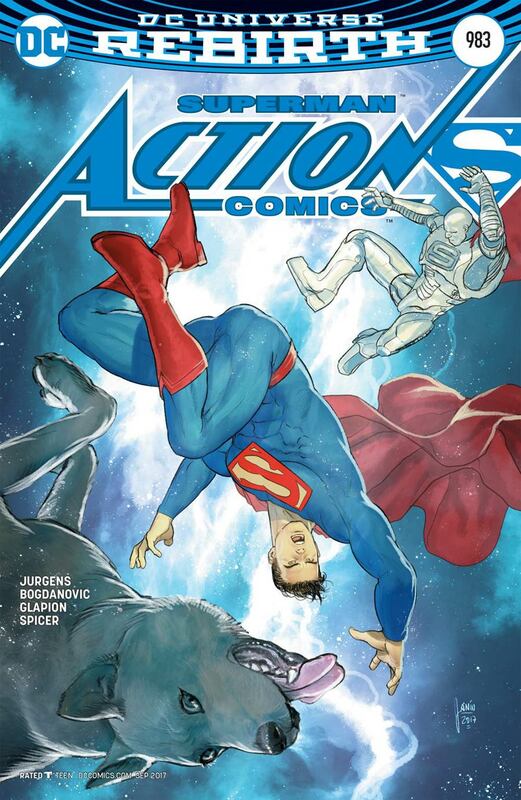 One of the many things I've liked about ACTION COMICS since REBIRTH began was how consistently good the art was with an emphasis on consistent. While the various artists have all had different styles they were similar enough that the rotating artists didn't feel jarring. Viktor Bogdanovic has an interesting style but it is a tad too cartoony when compared to the other artists on this story. Bear in mind that this is totally on me as the reader. It is not an indictment on Bogdanovic's abilities nor the talent of inker Jonathan Glapion. This is me not glomming on to the work. I've gotten used to a more illustrative style. I didn't like the faces on the characters in most of the panels and it seems like Superman has gotten about ten years younger than he has been presented. This feels more like a NEW 52 Superman story and not a REBIRTH story, which was distracting to me as a reader. I feel bad about not loving the art. I've been happy with the work we've been given on this title over the past year and this is the first time I didn't connect to it and that was a strange feeling to have. Again, I blame myself for this and not the artists. Cover Art - 4: I can't quite explain why I don't like this cover more. It is dynamic and has a fantastic design but there is something about it that keeps it from being a five out of five. 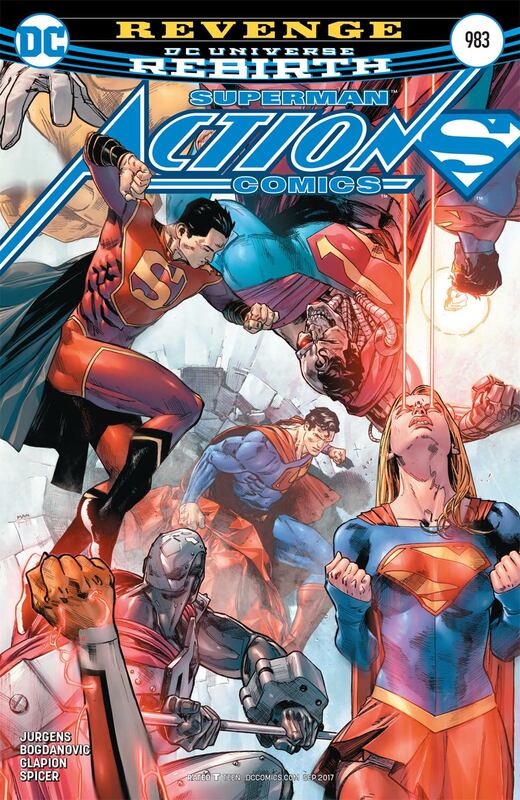 I do like that the Superman Family is the main draw of the piece. Variant Cover Art - 4: This cover was fine. Like the variant for last issue it's great as a piece of art but it didn't appeal to me.